The title of this blog entry is spoken by blues singer Ma Rainey, the title character in August Wilson’s play, Ma Rainey’s Black Bottom. She speaks the truth, I believe. I listen to music all the time: classical, folk, R&B, hip-hop when I’m running, musical soundtracks, more classical… But lately I’ve been missing something. I’ve missed making music. I’ve sung in choirs every year since elementary school, and I’ve played the clarinet since fourth grade (albeit less often since graduating from high school). But I’ve always loved to sing and really missed getting together with a group and making beautiful sounds. I have already attended numerous school concerts and presentations in Ukraine and am fascinated by Ukrainian folk songs – they have simple melodies and beautiful, raw harmonies. Everyone knows them, especially the Christmas and New Years’ songs. I want to learn them. Well, lucky me! I have my chance this spring because I just joined a newly-formed teachers’ choir in town. Our school director announced it the other week in our Friday teachers’ meeting, and afterward I asked her if maybe I could sing, too? She got very excited and said of course I could! So off I went last Sunday to the first rehearsal, where we spent of the time figuring out a rehearsal schedule. But we got to sing a little at the end, and I was excited to sing solfege! Sad, I know. But I really missed joining my voice with others’. It felt like another piece fell into place. We’ve had two real rehearsals and have already learned a folk song (see picture, below – it’s simple but beautiful). I think we’re also going to learn a cantata written by the man who’s directing us. He has a wonderful tenor – actually, in general the men have much better voices than the women. Maybe this is because they sing at church? The choir is also another great place to meet other teachers in town and get to know some teachers from my school a little better. Hello, community integration! 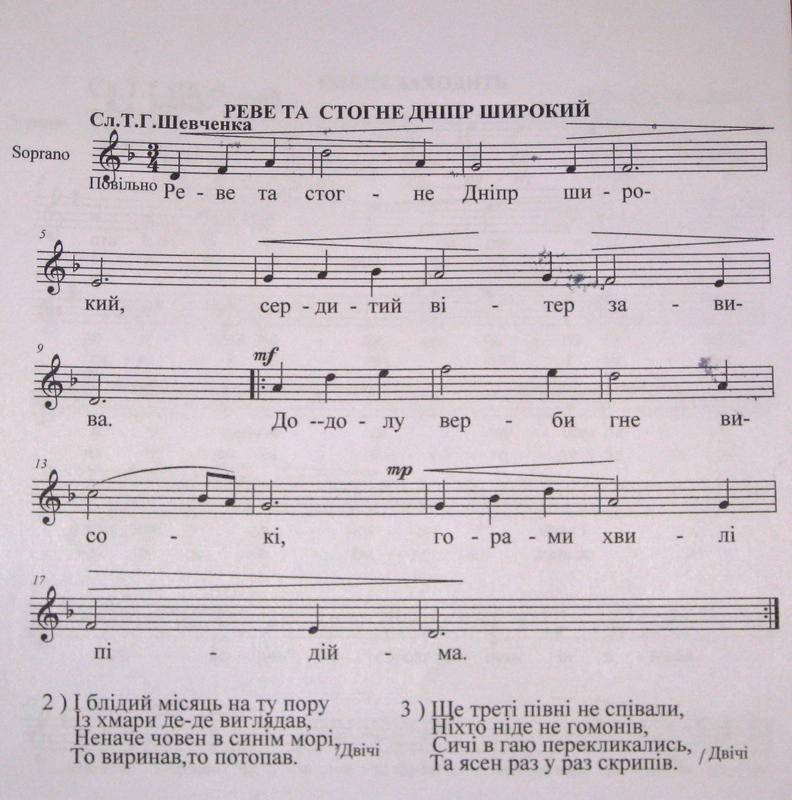 First song we learned in choir, and the first Ukrainian song I’ve learned! Why travel to Ukraine? My 6th-graders rock. And they cracked up when I had to start writing sideways and draw really long lines to fit all their reasons on the board. Lastly, I’d like to share with you something that I complain to myself about multiple times a day: Ukrainians have terrible sidewalk etiquette! Solo walkers walk smack dab in the middle of the sidewalk, making it really hard to pass them when I’m running, even walking. Walkers in groups are even worse: even if they see you coming at them, they rarely fall into single file to let you past – I usually end up having to step into the street so as not to be bowled over. OI! 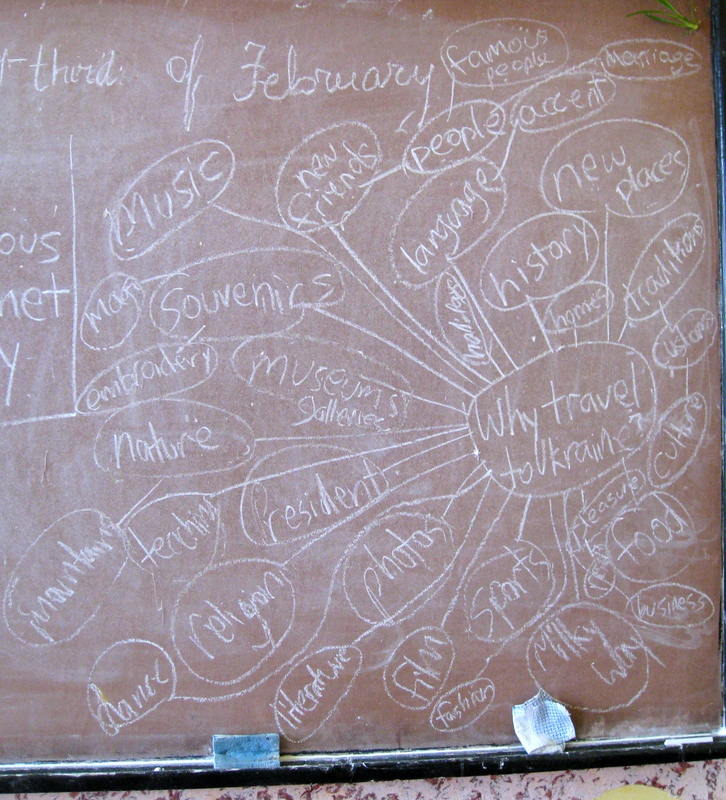 This entry was posted in community, music, pictures, travel on 27.02.2011 by taplatt. It was actually, believe it or not, one of the exercises in the book! Rock on. English sidewalk etiquette is terrible, too! You’d think, if they’re amongst the only ones who drive on the left, they’d WALK on the left. Foggedaboudit!